Naturalist Deb Gardner spends as much time as possible in Antarctica studying penguins. Here she meets Keller Sullivan and they begin a romance of sorts. They see each other when they're in Antarctica, but then go to their respective homes back in the US. Such are the lives of those who study Antarctic penguins. 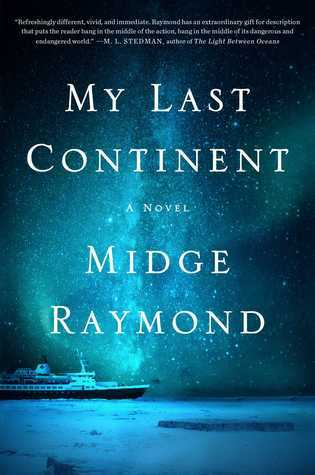 Conditions in the region are dangerous and precarious, and both Deb and Keller are caught up in a deadly disaster when a cruise ship travels too far into unsafe territory. The novel begins several years later, but moves back and forth between several time periods before and after the shipwreck. I really know how to pick a book for a cruise! In my defense, I only knew that it was about Antarctica and penguins - because what else would I need to know to pick a book? But luckily I'm not really bothered by that sort of thing. (I once read a book about a plane crash on a flight and I hate flying.) Lindsay over at Lindsay's Library shares my affinity for books that take place in cold climates. We both read Bleaker House and were disappointed by the lack of penguins, so when she mentioned this book and said it was very satisfying on the cold/penguins front I grabbed a copy from the library. It was very satisfying in these important elements. Parts of the book take place in Oregon and Missouri, but most of it is in icy Antarctica. 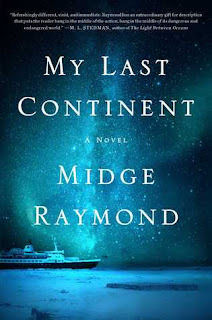 I thought Raymond did a great job in transporting readers to this unfamiliar landscape. I also learned about different types of penguins, other birds of the region, and even Yeti crabs. (Did you know they were a thing? I didn't even know they were a thing.) Deb felt most at home in this landscape, and her character was definitely a loner who didn't form relationships easily. Her romance with Keller was a surprise to her, and unsurprisingly, not terribly easy. For me, it started to drag a little in the middle, and I became slightly confused about the different time periods (though I know that's me, not the book), but then it really picked up again near the end. Mostly it was quite easy to read, and though it goes rather quickly I wouldn't call it a page-turner. It's slower paced and focuses a lot on the characters rather than the action, until the actual disaster is happening anyhow. Some parts of the story were a bit predictable, but I don't think this book is supposed to be full of surprises. It's also kind of a sad book. Parts of the main story are sad, and there's also an overarching environmental message that is not pleasant to think about, though it's undoubtedly true. I liked it a lot, but if you want a light-hearted pick-me-up, this isn't it. If, however, you are drawn to this sort of place, as I am, or you think you'd like a story about a disaster intertwined with a relationship story (that also might be rather disastrous) then you might like this as much as I did.